With so many different model ex21 engines this might help you when making a purchase or when trying to identify a part. 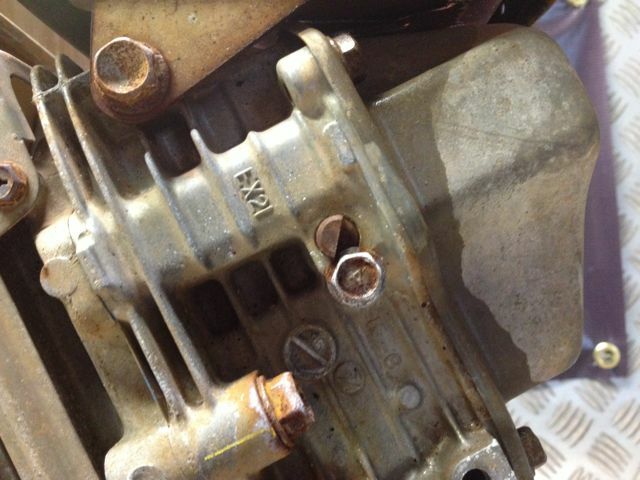 The pto or output shaft on Subaru EX21 engines can differ from different models. We have seen them in 3/4 imperial, 20mm metric and 22mm straight shaft plus tapered shaft for generator and pump engines as well as electric and recoil start. The cylinder head on this engine has EX21 cast into it. The ex21 is fitted with a governor, it is positioned under the fuel tank. 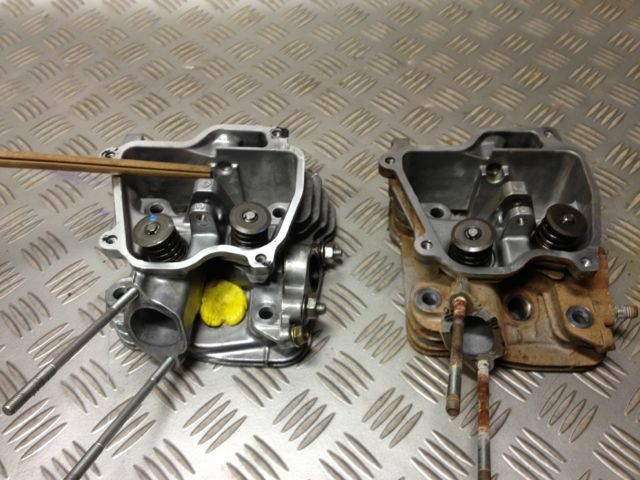 The KX21 air filter assembly on the left with the EX21 on the right, the bolt centre on the EX21 base is 2mm less than the KX21 air cleaner housing. 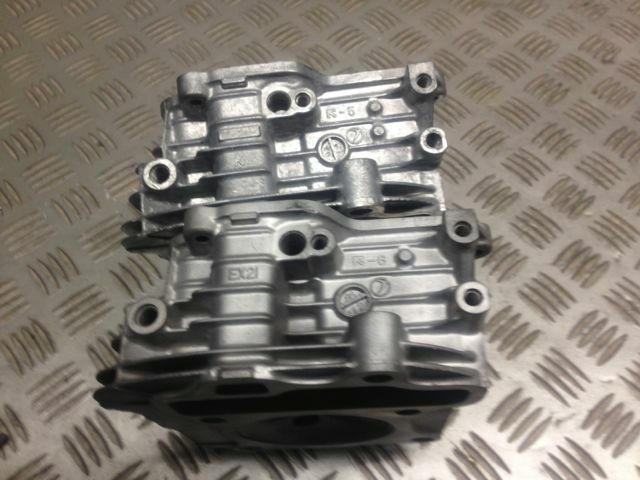 This picture shows the physical difference in side of the air box where it bolts to the ex21 and kx21 subaru engines. 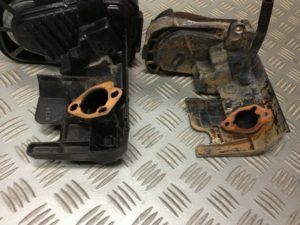 To convert a EX21 Subaru to a kx21 Subaru there are a few things that differ from the two engines. 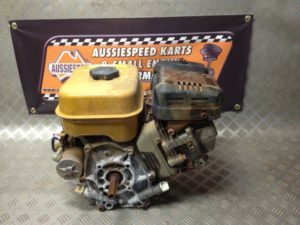 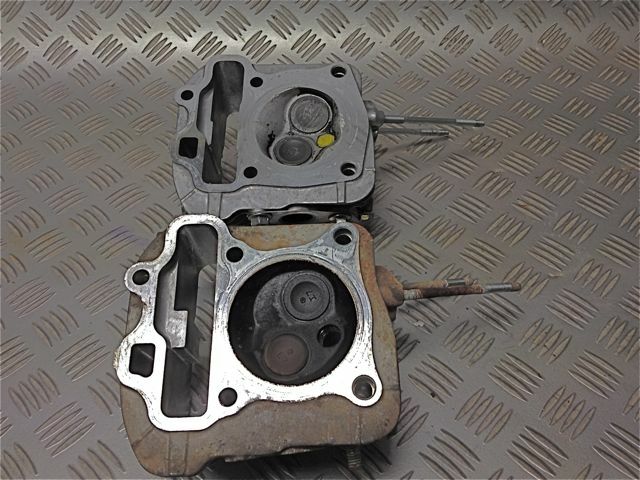 The standard short block from an EX21 is the same as what is used in the KX21 with the flywheel differing on the two engines as the KX21 runs more timing advance. 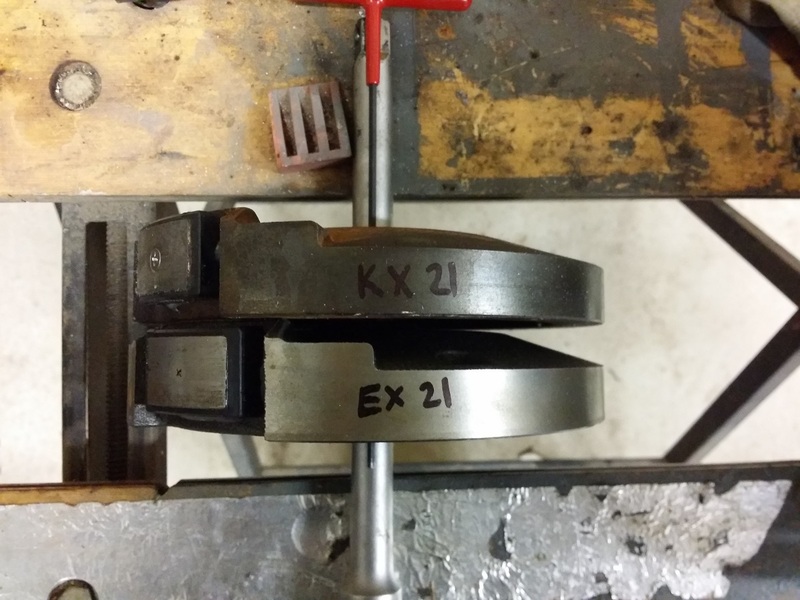 Note the magnet position, both the keyways are lined up this shows the EX21 has the magnet that triggers the coil is in a forward position. 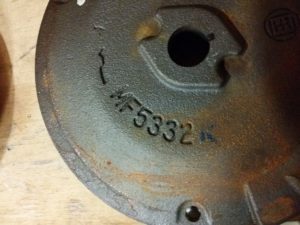 This is the part number on a KX21 flywheel. The cylinder head at the front is an EX21 cylinder head, note the rectangular hole that the cam chain runs through and you will notice the larger aluminum block. The KX21 has a phenolic block that mounts between the carburetor and the cylinder head. 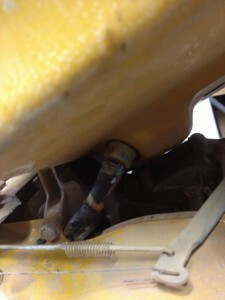 It is fitted with a brass vacuum take off to operate the fuel pump. 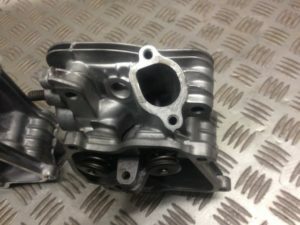 The cam locating position on the cylinder head is wider in the casting than the KX21 cylinder head. 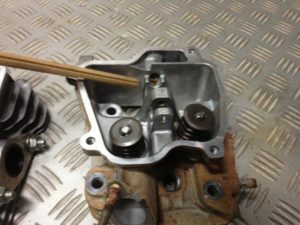 The narrower cam locating point on the KX21 cylinder head. 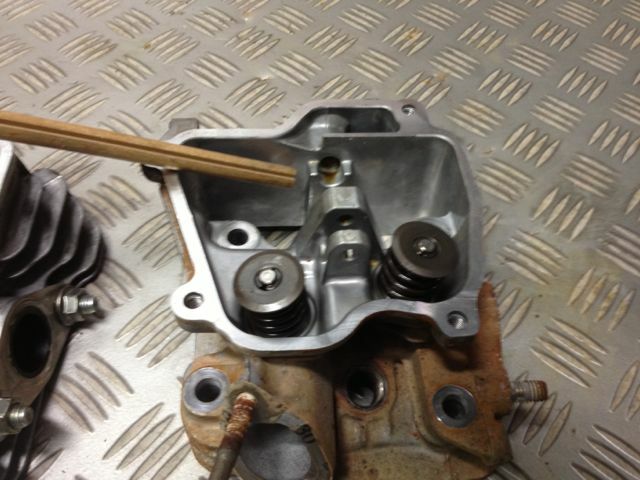 External markings on the cylinder head top cylinder head is the K or KX21 head. 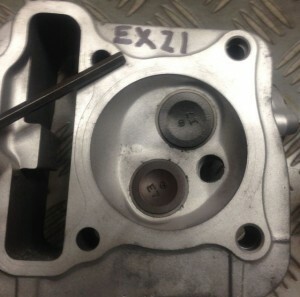 The bottom cylinder head is marked EX21. 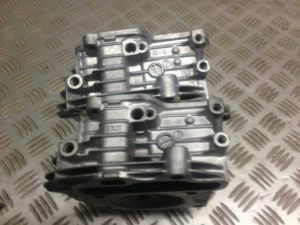 The open style combustion chamber of the EX21 cylinder head. 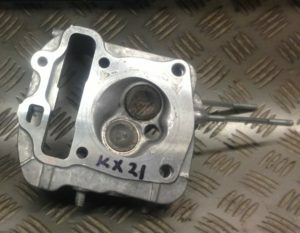 The combustion chamber of the kx21, note the smaller chamber and larger intake and exhaust valve. 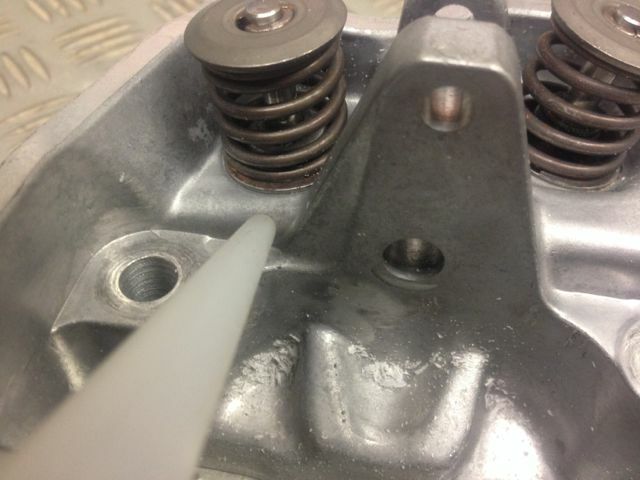 Intake port bolt centre on the EX21 engine is 47mm, this is smaller than the KX21 bolt port centre. 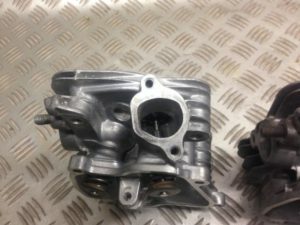 The intake centre bolt pattern for the KX21 cylinder head is 51mm The carburetor from a KX21 engine has a wider bolt centre than the EX21 by 4mm. 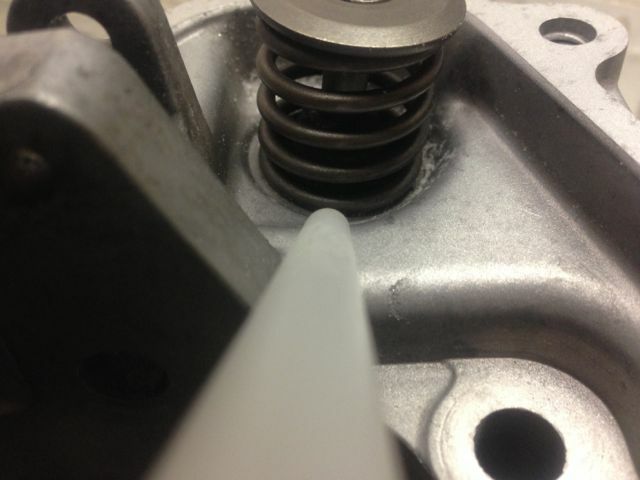 The EX21 valve spring sits directly on the cylinder head giving the the valve spring less installed seat pressure. Note on the base of the cylinder head and the valve spring the KX21 uses a washer or valve spring shim to increase the seat pressure of the valve spring. 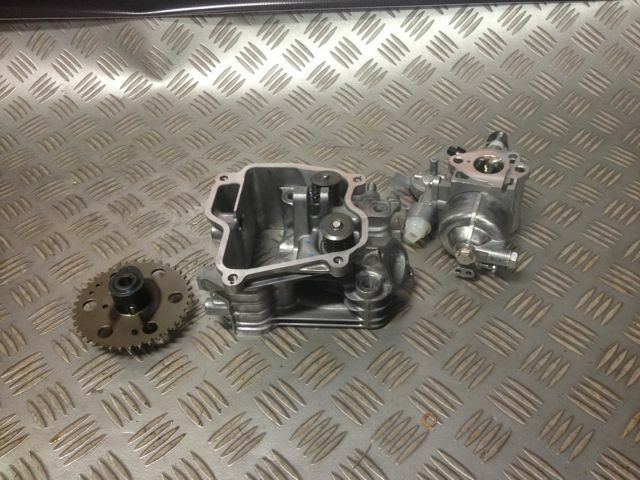 These are the major components for the conversion of changing from an EX21 to a KX21. 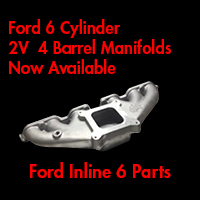 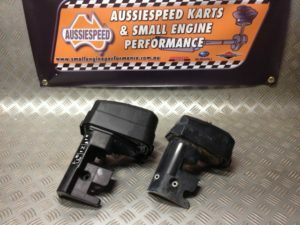 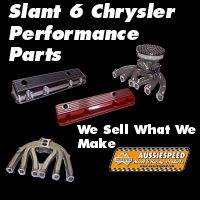 You will also need a carburetor insulator, we recommend a mushroom head style rocker arm pin. The air cleaner box assembly of the kx21 is larger. An after market style air cleaner can also be fitted. 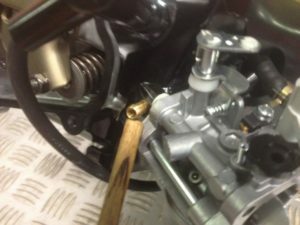 THIS PAGE WILL BE ADDED TO AS MORE PHOTOS BECOME AVAILABLE.